I crawled out of my cave and finally joined Twitter a few months ago. 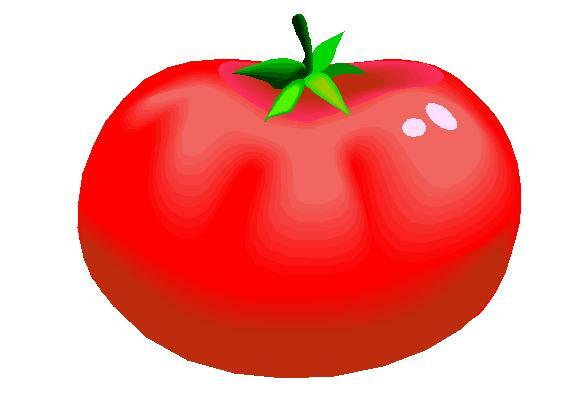 One of my favorite followees is VegWeb. They tweet delicious sounding recipes daily. I’ve gotten a few dinner ideas from their tweets! 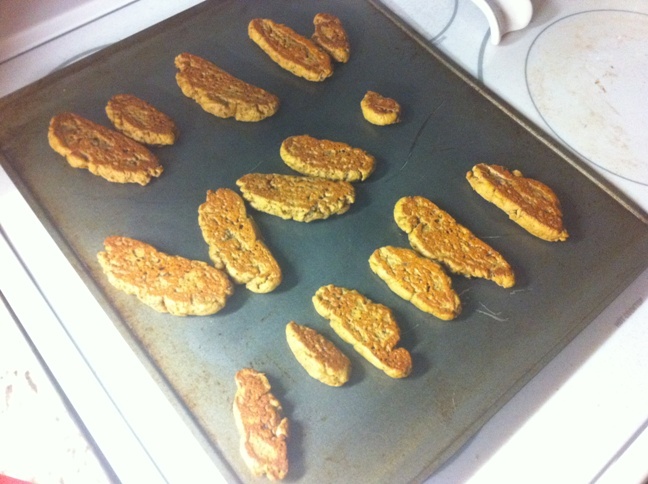 One of their tweets awhile back was an easy seitan recipe. (Seitan is a vegetarian protein made out of wheat gluten.) I had been wanting to try homemade seitan for awhile now but hadn’t gotten around to it yet. Even after the tweet I still put it off because I thought it was going to be a big ordeal. When I finally made it I was pleasantly surprised at how easy it was. 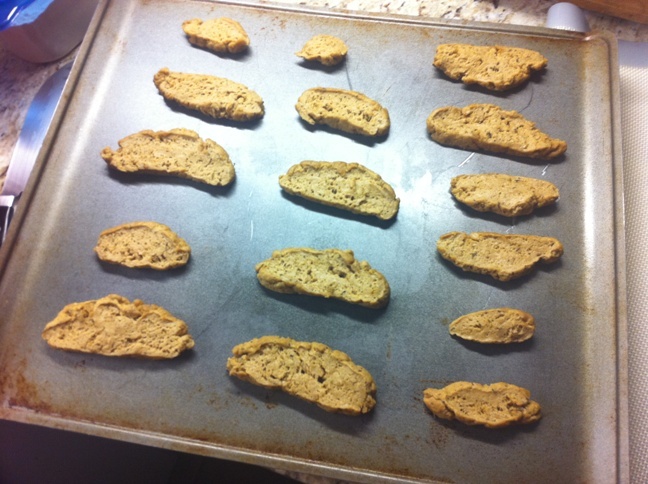 The recipe I used is Yummiest Seitan Ever! First mix the dough. It came together so easy and was not sticky at all. I mashed it into a ball with my hands. The texture wigged me out a little bit as it was almost too “meaty”. I made Benzo poke the dough to see how spongy it was. Then I sort of formed it into a log and sliced pieces off. I layed the pieces out on a baking sheet. Baked according to instructions, turning once in the middle. I ended up with several pieces of nicely browned seitan. Making the seitain was surprisingly quick and easy. And it made a larger quantity than I was expecting for only using 1 cup of wheat gluten. The pieces were a little chewy though. Next time I will try slicing them thinner or I may try boiling it as some commenters to the recipe suggest. 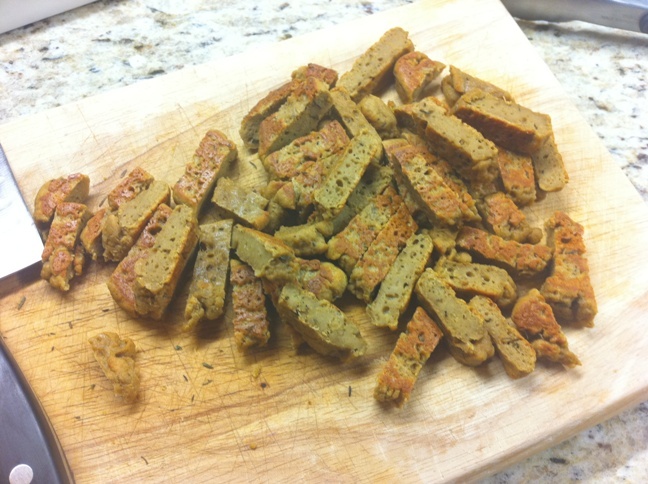 Now what to do with the seitan strips? You could just eat them as is, dipped into ketchup or bbq sauce. 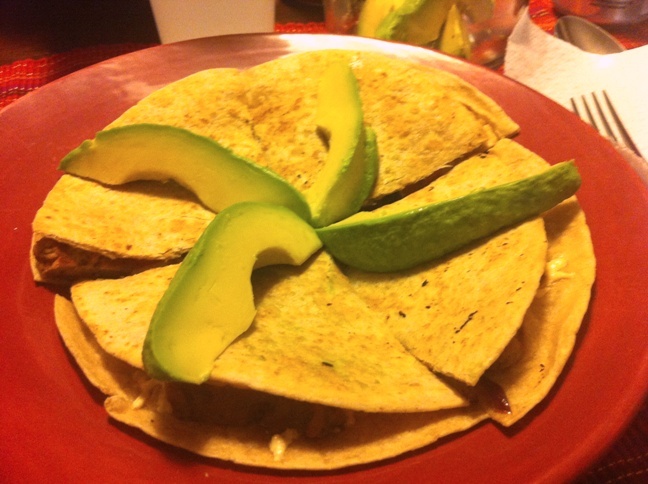 But I sliced mine into strips and turned them into a quesadilla. 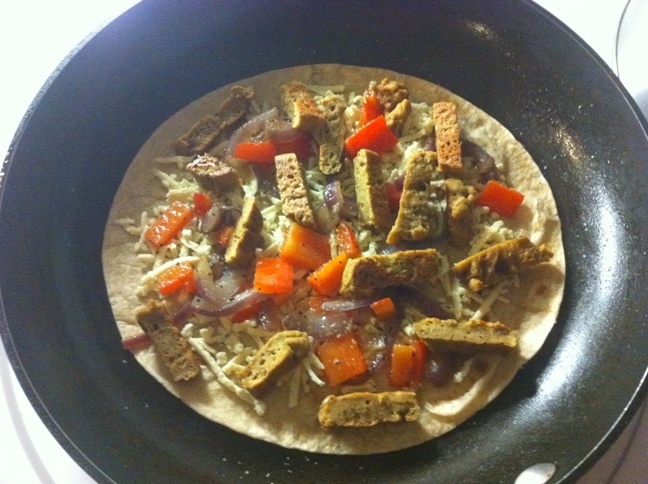 I topped a tortilla buttered with EB with the seitan stripps and added some cooked peppers and onions and daiya cheese. Then topped with another buttered tortilla. Brown on both sides until cheese is melted. Top with avocado or dip into guacuamole. I think seitan may be my favorite vegetarian protein. 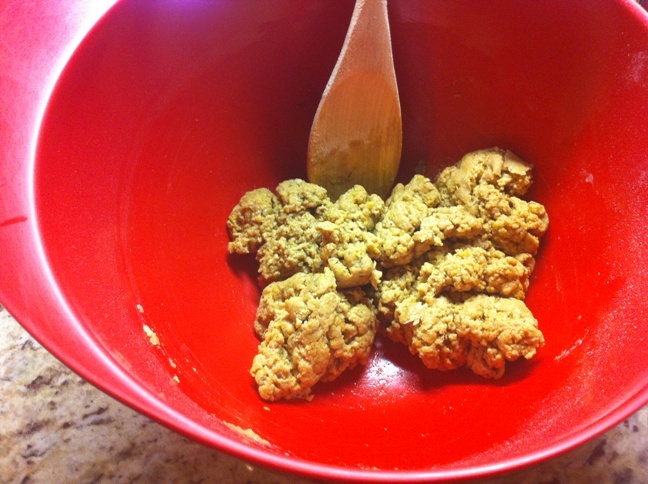 I’m looking forward to trying other recipes for homemade seitan. Suggestions welcome! You should try http://www.chooseveg.com/display_recipe.asp?recipe=382. WE love this recipe over rice or mashed potatoes AND you can use just the gravy part for almost anything you would put gravy on! It is also a good sight in general for some easy everyday vegan recipes. BTW i am new to your blog and i love it! Thank you for taking the time to put down your thoughts and experiences.